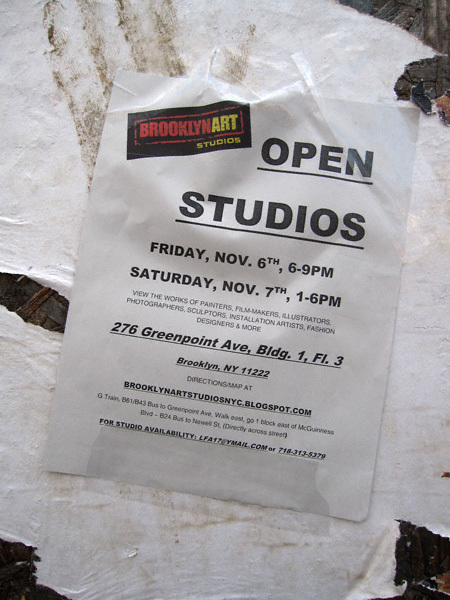 Brooklyn Art Studios is a new artists space in the Greenpoint Industrial Center at 276 Greenpoint Avenue in Greenpoint Brooklyn. We are a collection of professional artists working in a wide range of media. We will be hosting Open Studio events twice a year, and look forward to joining forces with local artists and arts organizations to promote arts in the Greenpoint area. This sounds to intriguing (and free!) to pass up. Check it out! November 6, 2009 6:00 – 9:00 p.m.; November 7, 2009 1:00 – 6:00 p.m. In the meantime you can learn more about Brooklyn Art Studio and its resident artists by clicking here.